Summer is right around the corner. Make your child’s summer one to remember with some educational fun at Lake Land College’s Summer College for Youth program. Summer College for Youth is now offered in Mattoon, Effingham and Teutopolis throughout the months of June, July and August. Black Rocket courses include 3D game design, basic coding language, Minecraft, Fortnite, and Star Wars animation. In these classes, students will work in pairs or teams. All student-created projects will be available on a password-protected Black Rocket website for students to share with their family and friends. All Black Rocket courses will be held on campus in Mattoon, Webb Hall, room 109. All Sciensational Workshop courses will be held at the Kluthe Center in Effingham, room 128. Little House on the Prairie, based on the rugged world of Laura Ingalls Wilder, will be held June 24–27 in Mattoon and Effingham. During this course, students will learn how to make butter, bread and yarn dolls. All children are invited to Camp Invention, a program offered through a partnership with the National Inventors Hall of Fame. This non-profit organization is dedicated to piquing curiosity and advancing the future of innovation and STEM. Program activities are led by experienced, local educators and inspired by the world-changing inventors that have been inducted into the Hall of Fame. Opportunities are available for students entering kindergarten through high school. Camp Invention will be held at Lake Land College in Mattoon, June 17–20 from 8:30 a.m. – 4:30 p.m.
Camp Invention will take place at the Teutopolis Grade School, July 15–18 from 8:30 a.m. – 4:30 p.m.
To register for Camp Invention, visit campinvention.org and click on “Register for Camp Invention!” in the top right corner. For more information, contact Jackie Wake, professional development support, at 217-234-5087 or jwake@lakelandcollege.edu. Lake Land College presented Heartland Dental with the 2019 Business Partnership Award at the April board of trustees meeting. Craig Kabbes, executive vice president, technology and patient marketing at Heartland Dental, accepted the award. Heartland Dental is the nation’s largest dental support organization providing non-clinical administrative support services to 1,400 supported dentists in more than 900 dental offices across 37 states. “Heartland Dental has been an invaluable industry partner and Laker Alumni supporter. Lake Land College looks forward to new collaborations on the horizon,” Lake Land College Board of Trustees Chair Dave Storm said. 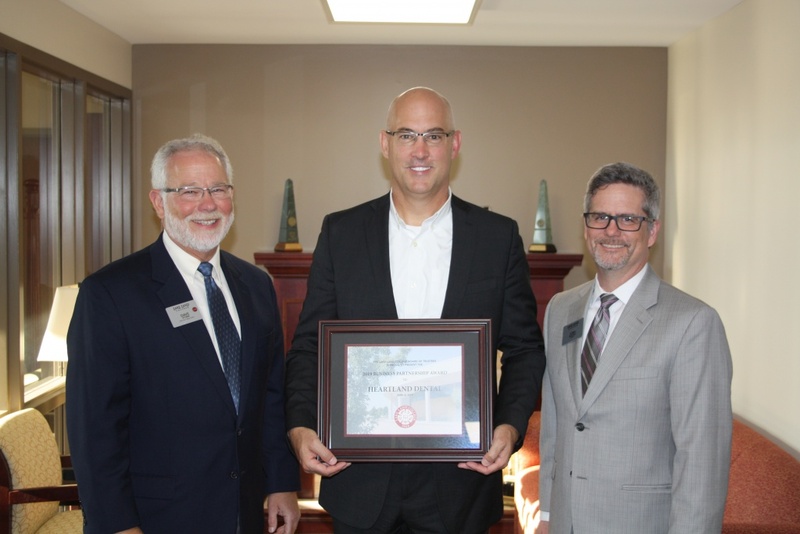 Lake Land College presented Heartland Dental with the 2019 Business Partnership Award at the April board of trustees meeting. Pictured from left to right: Lake Land College Board of Trustees Chair Dave Storm, Executive Vice President, Technology and Patient Marketing at Heartland Dental Craig Kabbes and Lake Land College President Josh Bullock. Heartland Dental recently provided the Lake Land College Foundation with a generous gift of $850,000 worth of new dental units, chairs, advanced equipment and an enhancement lab for students. “Due to the financial support of Heartland Dental, the college purchased computers and documentation software for every workstation in the clinic,” Division Chair Allied Health/Nursing Instructor Karla Hardiek said. The enhancement lab allows students to work one-on-one with instructors for extra practice helping students increase confidence with lab equipment. After working one-on-one with an instructor, students have expressed more confidence in their skills during hygiene clinics. Heartland Dental is dedicated to the continuing education of dental hygienists in the local community. In addition to being a clinical location for dental hygiene students, Heartland Dental also provides internship opportunities for the business division, professional development opportunities and mentoring opportunities through the Alumni Association, as well as consistently hiring Lake Land College graduates. “We are honored by this nomination and greatly appreciate the relationship we have with Lake Land College and we look forward to continued partnership,” Patrick C. Bauer, president and CEO of Heartland Dental, said. For more information about the Heartland Dental Dental Hygiene Lab and the dental hygiene program at Lake Land College, visit lakelandcollege.edu/dental-hygiene. Potential students interested in pursuing a career in the medical field are welcome to explore career options at the Health CareeRX college fair on Monday, April 29 from 6:30-8 p.m. at Lake Land College, Neal Hall. Area health care professionals from several colleges and businesses will discuss their health career programs and hiring practices. Tours of the Lake Land College nursing lab will also be provided. Colleges currently scheduled to attend include Danville Area Community College, Eastern Illinois University, Eureka College, Indiana State University, Indiana University – Purdue University Indianapolis, Iowa Wesleyan, Lake Land College, Lakeview College of Nursing, Southern Illinois University – Carbondale – School of Medicine, University of Illinois Springfield, Southern Illinois University – Edwardsville – School of Pharmacy. More colleges and universities are anticipated to attend. The college fair is coordinated through the Health CareeRX Club partnership. Health CareeRX is a student club organized for high school students interested in pursuing a career in health care, which is supported by the Area Health Education Centers organization, Carle Foundation Hospital, Sara Bush Lincoln Hospital, Eastern Illinois Education for Employment Systems, Eastern Illinois University, Lake Land College and Southern Illinois University School of Medicine. All interested high school and college students, parents and general public are welcome to attend. Pizza and drinks will be provided. For more information email CareeRX at healthcareerx@gmail.com. The East Central Harmony Chorus, local chapter of Sweet Adelines International, is set to take the Lake Land College Theater stage Thursday, April 18 beginning at 7 p.m.
Barbershop harmony, a style of a cappella, will be showcasing a 20 minute program featuring a variety of songs. Following the performance, all audience members are encouraged to stay and learn a selected barbershop song and harmonize with the chorus. “Each song will be a surprise to the audience. We are really looking forward to doing this show,” Becky McDuffee, musical director, said. Sweet Adelines is an international organization of women singers dedicated to the education and performance of the barbershop harmony musical art form. As one of the largest singing organizations for women, Sweet Adelines is made up of more than 20,000 members that span five continents. For more information contact McDuffee at 217-714-4520 or becky.mcduffee@gmail.com. Area archaeologist Dr. B. Jacob Skousen is set to present A Walk Through the Pre-Columbian History of Southeastern Illinois on Thursday, April 25 from 7-9 p.m. at the Lake Land College Theater. “We know relatively little about the distant past in southeastern Illinois. The limited available archaeological evidence indicates that this region was inhabited for the last 10,000 years and has a dynamic and complex history,” Skousen said. Skousen will discuss the results of his current research at the Otter Pond site, located along the Embarras River which dates to roughly 1100 to 1500 C.E. This site was the largest town in the region and may have been built to mimic the city of Cahokia, located nearly 150 miles away. The public is welcome to attend the free event. For more information contact Skousen at bskousen@illinois.edu. Lake Land College is offering a Painting with Oils or Acrylics class at the Kluthe Center in Effingham. The six-session class will be on Wednesdays beginning April 24 through May and will meet from 10 a.m. to 12 p.m. The class will be taught by Vera Keplar who has a master’s degree in art from Eastern Illinois University and has taught art at K-12 and adult level for many years. In addition, Vera has been a judge for several art competitions. Beginner and experienced artists are all welcome to attend. Students will paint on canvas using oil or acrylic paints and will be able to choose their own subject matter. Students will need to bring their own paint supplies. The supply list includes: basic colors of oil or acrylic tubes of paint, variety of sizes of oil or acrylic paint brushes and 16” x 20” minimum size canvas panels or stretch panels. The cost is $40 for the class. To register, go to https://www.lakelandcollege.edu/learn. Drop date for a refund is five business days prior to the class. For more information, contact Jackie Wake, professional development support at 217-234-5087 or email jwake@lakelandcollege.edu. The Lake Land College Medical Assistant Program is expanding to the Kluthe Center in Effingham where classes will be available in a hybrid format. A hybrid format class is designed with the typical busy student in mind as classes are offered online with labs held only one night each week. “We are excited to offer hybrid classes at the Kluthe Center because approximately half of our current students are from the Effingham area,” said Medical Assistant Instructor Molly Yeske. Medical Assistant is a special admission program that trains students in both administrative and clinical duties in health care settings. Administrative duties of the medical assistant may include assistance with office procedures, scheduling and billing and clinical duties may include patient care, phlebotomy and injections. The Medical Assistant program is available as a two-year associate in applied science degree or one-year certificate program. For more information about the Medical Assistant program and registration for classes visit lakelandcollege.edu/high-demand-programs/medical-assistant or contact Yeske at 217-234-5055 or myeske@lakelandcolleg.edu. Lake Land College instructor Marcy Satterwhite, Urbana, recently received the 2019 Teacher of the Year Award from the Eastern Illinois Business Education Association (EIBEA) during the organization’s spring meeting held on campus. 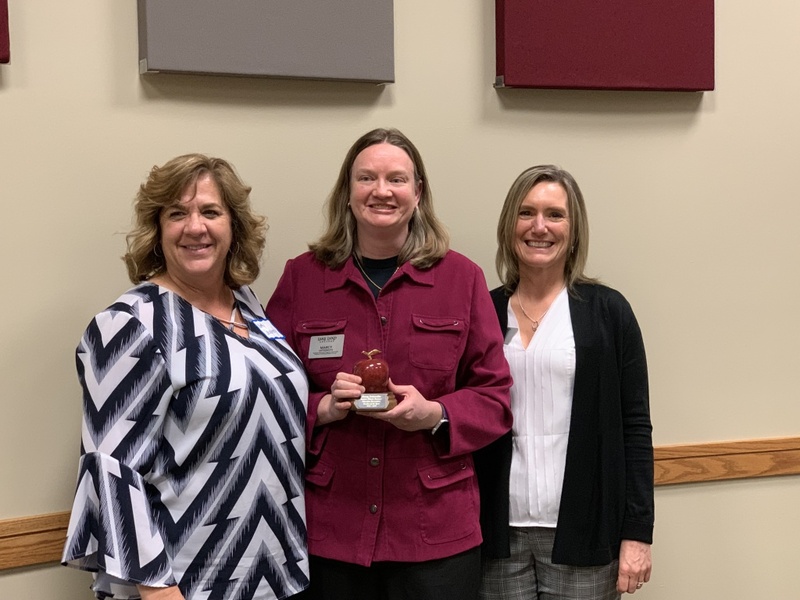 Lake Land College instructor Marcy Satterwhite, Urbana, recently received the 2019 Teacher of the Year Award from the Eastern Illinois Business Education Association (EIBEA) during the organization’s spring meeting held on campus. Pictured from left to right are Kathleen Daugherty, business instructor/program coordinator, office professional-medical, Marcy Satterwhite, business instructor/program coordinator/desktop publishing/graphic design instructor and Cindy Phipps, business instructor/program coordinator accounting. EIBEA represents and promotes business education throughout the eastern Illinois area. The main objective of EIBEA is to plan, develop and sustain programs for business education professionals and students through meetings, discussions and conferences. Satterwhite, business instructor/program coordinator/desktop publishing/graphic design instructor, has devoted more than 20 years to EIBEA and has held the position of EIBEA president since 2013. Her commitment to business education is clear as she continuously contributes to opportunities for meetings and meaningful professional development activities for business educators in the eastern Illinois area. Prior to serving as EIBEA president, Satterwhite served as EIBEA vice president and as an EIBEA representative to the Illinois Business Education Association (IBEA) board for several years. She is also one of the biggest promotors of the IBEA fall conference. For more information about the Lake Land College Business Division, visit lakelandcollege.edu/academic-divisions/business-division. Lake Land College Center for Business & Industry is offering a 50-hour Pharmacy Technician course on Tuesdays and Thursdays, beginning June 11, from 6-9:30 p.m. The course will prepare students to work as a pharmacy technician in a retail or other pharmacy setting and to take the Pharmacy Technician Certification Board’s PTCB exam. Through classroom lecture and hands-on labs, students will review dosage calculations, drug classifications, the “top 200 drugs”, I.V. flow rates, sterile compounding, dose conversions, aseptic technique, the handling of sterile products, total parenteral nutrition (TPN), dispensing of prescriptions, inventory control and billing and reimbursement. Class will be held at Lake Land College, 5001 Lake Land Blvd. at the Northeast Building, room 113. The cost is $1,399. Textbooks are included. For more information, contact Jackie Wake, professional development support, at 217-234-5087 or email jwake@lakelandcollege.edu. Lake Land College recently held its annual Club Recognition Luncheon where several official student clubs were recognized. Awards for the 2018-2019 academic year include Outstanding Club Award, Outstanding Club Advisor Award, Collaboration Award, Community Impact Award, Laker Image Award and People’s Choice Award. Phi Theta Kappa received the Outstanding Club Award after a successful year of reaching five-star chapter status for the first time in the history of Lake Land College. To be eligible for outstanding club of the year and considered an active student club, each club must accomplish its objectives as stated in the club’s constitution and bylaws, maintain a high attendance and participation record of its members, maintain adequate minutes of its meeting and records of its activities, have an up-to-date roster of its members and officers, have complete and accurate financial records of its activities and be a solvent organization. The club must present this information to the Student Government Association (SGA). Krista Burrell, academic counselor and Phi Theta Kappa advisor, received the Outstanding Club Advisor Award. The Outstanding Club Advisor recipient must have a strong educational role within the group and must demonstrate dedication, availability and energy toward club objectives and members. “Krista is a motivated, energetic and a valuable source for the club, pushing Phi Theta Kappa to accomplish more than Lake Land has ever seen. She is truly the backbone of a club that is going above and beyond for Lake Land and its community,” Burrell’s nominee said. Both Future Educators Association (FEA) and Early Childhood Education and Family Services (ECE) clubs received the newly added Collaboration Award. The Collaboration Award recognizes a group of organizations that have successfully worked together to sponsor or host an event or program that has benefited the Lake Land campus and community. Each semester FEA and ECE cooperatively create and organize events for children in the community. In November FEA hosted a Polar Express Kid’s Night Out event that ECE and SGA helped coordinate. This semester, ECE will host a Peter Rabbit Kid’s Day Out event that FEA assists with on Saturday, April 13. The Community Impact Award was given to Club I.T. which recognizes a club that has contributed time, support or money on a local level to better the Lake Land district, campus and community. Club I.T. orchestrated and provided assistance to four community events on campus this year. These events include: assisting with Club I.T. Garden, Cans for Credit, Business Divisions Computer Contest, and work on the campus’ disc golf course. Recently, Club I.T. assisted with the LifeSpan Center’s Tech Savvy Saturday event where club members helped community members learn the nuances of technology devices. The Laker Image Award was given to the International Club for demonstrating excellence in the fulfillment of its purpose, membership and leadership development, positive school spirit, campus life enhancement, community contributions and general involvement in Laker Nation. The International Club focuses on sharing cultures through meetings, events, parties, trips and further Lake Land involvement. International Coffee Hour is hosted each Wednesday at 11 a.m. for international students and American students to chat and explore different cultures through English conversation. The International Club will host the annual International Food Festival Wednesday, April 3, 11 a.m. in the Field House, room 104. The new People’s Choice Award was presented to the PRIDE Club after voting ballots were collected throughout the luncheon. Clubs interested in being recognized with the People’s Choice Award were given three minutes to highlight their club accomplishments during the luncheon. Attendees then voted on the club that deserved special recognition. Criteria included: school spirit and enthusiasm, overcoming obstacles, innovative programming and quality of presentation. The PRIDE Club provides a safe environment for LGBT+ students to engage and collaborate to spread awareness across the Lake Land College campus and community. The club raises money through bake sales and other fundraisers to donate to LGBT+ positive organizations and support groups. Recent proceeds were donated to the National LGBT Hotline, which is a helpline that provides both phone lines and online talk groups for those looking for support. For more information about Lake Land’s clubs and organizations, visit lakelandcollege.edu and look for the “Student Life” drop-down menu.